I hope you all have had a great week. My week has been quite busy (TGIF)! As many of you may have seen from my last thrifting adventure, I grabbed a bold printed shirt for around $1. 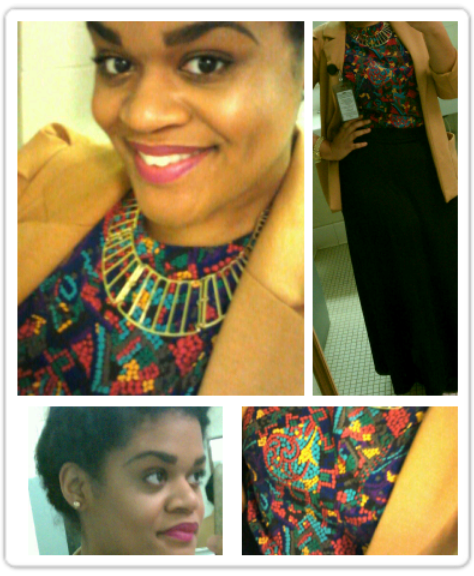 I paired it today with a solid blazer and skirt to make it work appropriate. I enjoy wearing colors at work. What do you think? Do you have any parts of "you" you incorporate into your work attire? Those eyebrows...I LOVE THEM! & UR OUTFIT IS VERY NICE! I love doing bold prints in the office - it's a great way to liven up your work week!